Fat sometimes gets a bad rap, partially because we associate it with obesity. Yet, fats in dog food are a necessary component of a dog’s diet. Your dog needs a certain amount of dietary fat to supply essential fatty acids that their bodies need but can’t make. 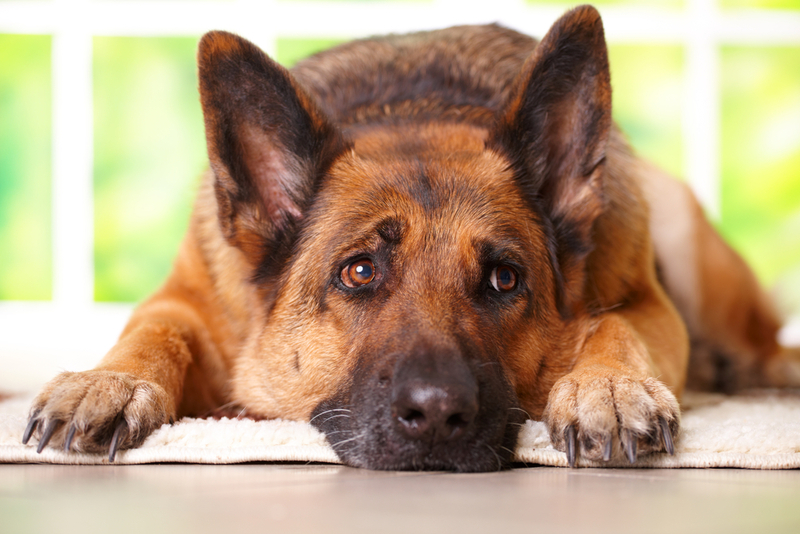 Without these essential fatty acids, your dog’s health will suffer. In addition, fat supplies a source of energy. In fact, fat supplies almost twice the energy that proteins and carbohydrates do. Fats are composed of a chemical backbone that has fatty acids attached to it. Fats, in general, come in two main types: saturated fat and unsaturated fats. Unsaturated fats can be further divided into monounsaturated and polyunsaturated fat. The fatty acids that attach to polyunsaturated fats are sub-divided into two classes: omega-6 and omega-3. Dogs need two essential fatty acids in their diet for good health. One omega-6 fatty acid that’s necessary for a dog’s diet is linoleic acid. One of the best sources of linoleic acid is corn oil. Chicken fat and canola oil also contain modest quantities of linoleic acid, but olive oil contains little of this essential fat. Beef fat and coconut oil contain even less omega-6. Another essential fatty acid in the polyunsaturated fat category is alpha-linolenic acid or ALA. ALA is mainly in plant-based foods like walnuts, sesame seeds, and flaxseed. This fat falls into the class of fatty acids called omega-3s. Other omega-3’s, called EPA and DHA, are also important in a dog’s diet. They aren’t absolutely essential as dogs can convert small amounts of ALA into EPA and DHA. However, the amount they can convert is typically small (less than 10%). That’s why a dog’s diet should include a source of EPA and DHA. The best source of these omega-3 fatty acids is fatty fish and fish oil. Grass-fed beef also contains omega-3 fatty acids, although grain-fed cows are not a good source. Eating food sources that are high in omega-6’s and low in omega-3’s isn’t healthy, as studies suggest that consuming a high ratio of omega-6 to omega-3 is associated with inflammation. Omega-3s are incorporated into the membranes of all the cells in a dog’s body. These fatty acids also have an anti-inflammatory effect. That’s important since inflammation is a driving force behind many health problems that plague dogs and humans, including inflammatory bowel disease, diabetes, cancer, arthritis, and allergies. Omega-3s are also important for a dog’s development. A study published in the Journal of the Veterinary Medical Association found that DHA in fish oil promotes healthy brain and eye function in young pups. Wolves that live in the wild naturally consume more omega-3s as they eat wild animals that accumulate higher levels of omega-3s than what you find in the typical dog’s diet. Ideally, a dog should consume a ratio of omega-6 to omega-3 of around 3 to 1. However, many dogs eat diets that contain ratios as high as 20 to 1. But dogs aren’t alone. Humans also eat a diet that’s too high in omega-6s too as omega-6s are abundant in processed foods. 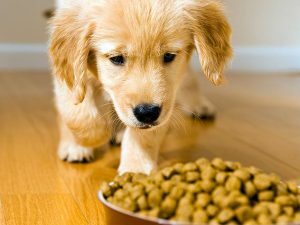 In most cases, the unhealthy ratio in dogs stems from the commercial dog food they eat. Many dog foods are grain-based and contain an abundance of omega-6 fatty acids. Manufacturers often make dog food with inexpensive oils that are high in omega-6, and dogs typically don’t get enough omega-3s in their diet to bring the ratio down to a healthier level. It’s also important to keep in mind that you don’t want to overdo the fat as some dogs are prone to pancreatitis and a high-fat diet increases the risk. A diet that contains a balanced ratio of protein, carbohydrates, and fats is best for the health of your dog. Since dogs are usually deficient in omega-3s, particularly EPA and DHA, these are the types of fats they need more of in their diet. The best way to start is by choosing a dog food that contains a healthy ratio of omega-6 to omega-3. 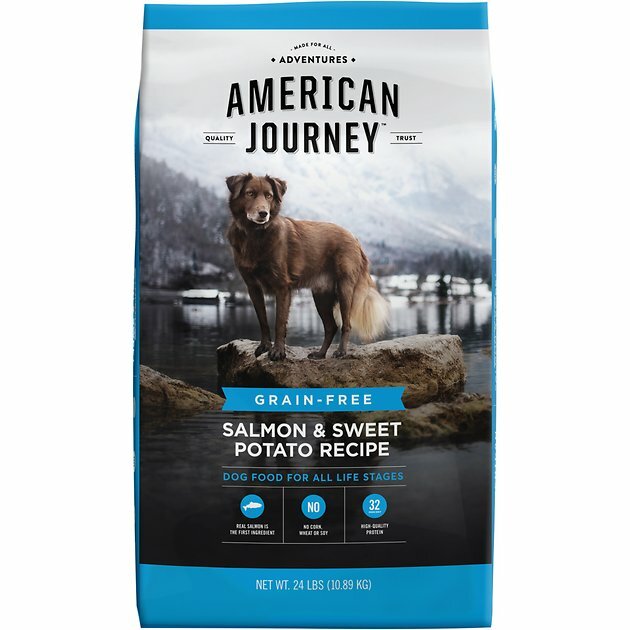 American Journey Salmon & Sweet Potato Recipe Grain-Free Dry Dog Food is a grain-free dog food made with deboned salmon and salmon oil, a rich source of DHA and EPA. It also contains ingredients with ALA, the plant-based form of omega-3 such as flaxseed and dried kelp. It’s high in protein without components you don’t want in your dog’s diet, like corn, wheat, and soy. You can also give your dog an omega-3 supplement to supply the DHA and EPA their diet may be lacking. Nutramax Welactin Canine Omega-3 Softgel Capsules Dog Supplement is a rich source of DHA and EPA from wild-caught, cold-water fish. Another option is to give your dog treats that contain EPA and DHA. One that all dogs are sure to love is Zesty Paws Omega-3 Salmon Bites EPA & DHA Support Salmon Flavor Chews for Dogs. These tasty treats are made from wild Alaskan salmon and salmon meal. Along with fatty acids, they contain biotin, a B-vitamin that’s important for a healthy coat and fur. Be sure to ask your veterinarian before giving your dog supplements, especially if they have medical problems or are taking other medications. For more healthy dog food options, check out these best-selling grain-free dog foods that we recommend.